Roberta Wallis is Managing Director for Information Technology at UNICEF USA. She joined the organization in 1998 and was appointed to her current position in 2004. She has worked in higher education and at nonprofit organizations since 1979 and previously held leadership positions in Information Technology at the New York Public Library and the Natural Resources Defense Council. 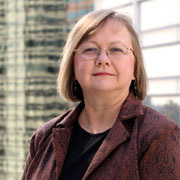 Roberta earned a Bachelor's degree in Business Administration from the University of Florida and a Master’s degree in Information Science from Rutgers University. A native of Florida and now a resident of New Jersey, Roberta is also a lifelong guitarist and singer—skills she puts to work in area community choruses and church choir groups. She has served on the boards of New Jersey Choral Society and the Community Church of New York.